Bruce Kay, Pacific Northwest National Laboratory. Dr. Bruce Kay, a chemical physicist at Pacific Northwest National Laboratory, was elected a member of the Washington State Academy of Sciences. He joins other scientists and engineers from across the state in being recognized for their outstanding scientific achievement and leadership. Academy members provide expert scientific and engineering analysis to advise state policy makers on issues involving science, technology, health, and the environment. In addition, they work to increase the role and visibility of science in Washington state. Kay is an internationally recognized experimental chemical physicist and a world leader in the use of molecular beams to study a broad range of problems in condensed phase and interfacial chemistry and physics. In related research, he demonstrated the role surface dissociation and recombination play in the uptake and release kinetics of hydrogen from bulk solid solution and hydride phases of materials. 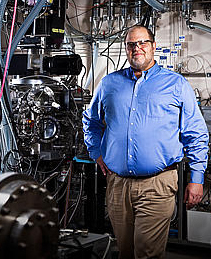 Since joining PNNL he has pioneered the use of nanoscale films of amorphous ice for studying processes relevant to normal and deeply supercooled liquid water. The academy was created in 2005 and consists of members from diverse academic disciplines and industries, including aerospace, agriculture, computer, science, energy, engineering, ecology and transportation. This brings PNNL’s total number of current and emeritus staff who are members to 15. The incoming members will be honored at the academy’s annual meeting in Seattle in September.